World's most powerful 15" mobile Workstation with Intel® processors, a PremierColor UHD display option and up to 3TB of storage. High-powered processors: We know you take on the biggest tasks. So we offer the best processors available. The Precision 7520 mobile Workstation delivers no-holds-barred processing power with the blazing performance of 7th Generation Intel ® Core i5, i7 and Intel® Xeon® processors. Genius in the details: A premium, innovative design delivers up to four impeccable display options up to Ultra HD with 100% Adobe RGB and 8 million pixels. With detail this vivid, youll see everything in crisp, glorious definition. High-performance graphics: Next generation professional-grade 2xRadeon Pro WX and 2xNVIDIA Quadro® graphics options with up to 4GB of graphics memory. Super high-speed 2400Mhz and 2667MHz of DDR4 memory keep pace with demanding 3D rendering and other graphics-intensive tasks. Enjoy a long life: Youll get plenty of charge with the long lasting 91WHr battery. The Dell Precision 15 7510 range presents the convenience of a laptop with the power of a desktop. They’re great for anyone from busy students to office workers, and everyone in between. 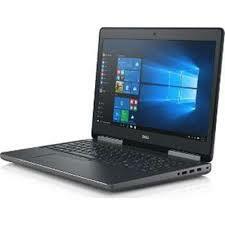 Both in terms of their display and their graphics, the Dell Precision 15 7510 range present images, colours, text, photographs and video superbly. An 8 million pixel, 4k Ultra HD display allows everything from the most mundane text document to the most beautiful photograph to pop from the screen, and the graphics options ensure that your gaming, 3D rendering, streaming and video can keep up. These include AMD FirePro and NVIDIA Quadro graphics, with up to to 4GB of GDDR5 memory – powerful, productive and precise. The Dell Precision 15 7510 range ensures that the power of the device doesn’t make it a heavy, unwieldy item to carry around. The redesigned chassis provides a light touch to a heavy-duty laptop, with strong but very light materials ensuring that you can quickly transport it on whatever plane, train or bus you need to. Meanwhile, the power of the 6th Generation Intel Core i5 and i7 and first ever mobile Intel Xeon processor options allow you the performance that you need to work on big projects, without slowing you down. When you’re hard at work, the thermal cooling systems ensure that the device is kept cool, even when working at very high frequencies. With reliable solid state PCIe NVMe storage – up to 3TB in total – you can store, access and transfer complex files without the need for external hard drives. The advanced docking found in the range can allow support for up to five full HD displays, and make for very fast data transfers too. There are up to ten ports and slots included. ITC Sales offers you these fantastic Dell Precision 15 7510 range devices at great prices. With open box, manufacturer refurbished and ex-display items, and new ones too, you’ll find the perfect model. As our stock is updated continuously, you’ll find plenty more too – we’re always available to talk through your needs. With fast delivery times and warranties included, ITC Sales is the perfect choice in helping you to locate your Dell Precision laptop. We’re registered Dell partners, and experts in our field.